As a kid I remember watching the old Tarzan television show. Every Sunday night, the five or six year old me sat on the floor in front of my family’s black and white television set (complete with “rabbit ears” of course) eating a big bowl of popcorn entranced by each episode. Muscles bulging, the broad chested Tarzan would swing through the canopy of the jungle shouting his signature “AH-aha-ha-AH-ahaaa…” It reveals much about the real me to say I could have cared less about is muscles and loin cloth, but I was enamored with the exotic setting, the wildlife and the possibility of swinging on a vine. Of Tarzan’s many adventures, I was fascinated by the ones involving quicksand. To my knowledge, there was nothing like that surrounding the red clay dirt of our family home on Goat Pasture Road. Since I watched every episode, I felt a bit like an expert on the subject of quicksand. I knew that the more you struggled in the quicksand, the faster it pulled you under. Quicksand could devour a grown man in seconds or a grown woman more slowly, particularly if she were beautiful and helpless, screaming at the top of her lungs to be rescued moments before her head went under. I have learned through my post-travel research that quicksand does indeed exist in certain parts of Africa near wetlands where the upper surface dries out and the lower ones become water-logged and unstable. I was reminded of quicksand in central Tanzania. Our group was staying in a beautiful tented camp across from the Tarangire National Park, perched on a knoll overlooking Lake Barunga. 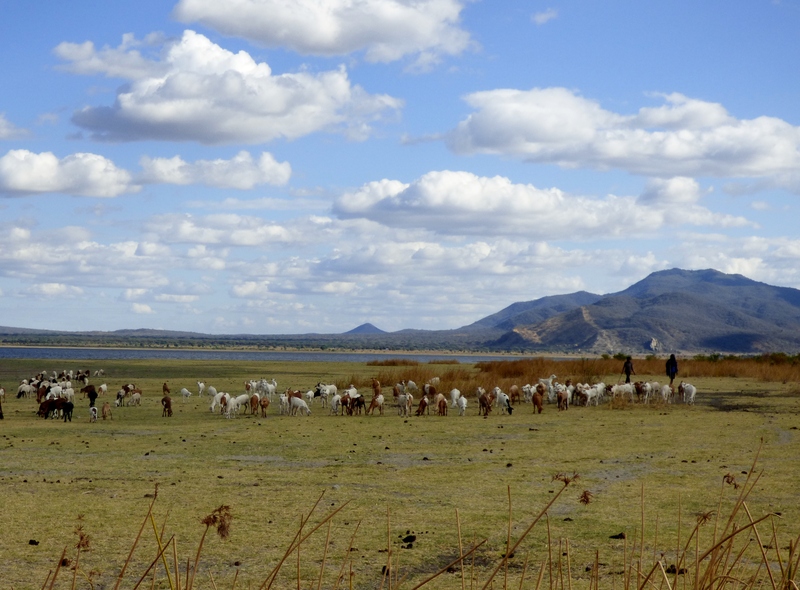 This picturesque round lake sits like a shining jewel mocking the poverty and dust of Africa; it’s saline waters are too harsh to sustain much life except for flamingos and an assortment seabirds. One hot afternoon, our group hiked from our campsite through the scrubby undergrowth, down the hillside and onto the wide sandy beach. Silhouetted against the distant hills, we could see several young Masaii natives herding a large flock of goats. The goats jostled about noisily. We met them a short ways up the beach juxtaposing ourselves in their midst for photographs, the goats scattering around us like water pouring through a sieve. 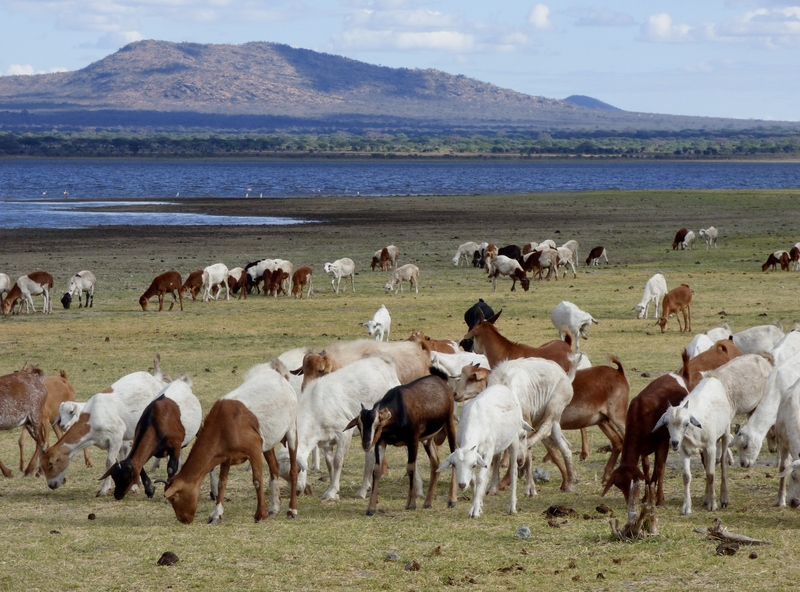 Masaii shepherds with their flocks along the shore of Lake Barunga. 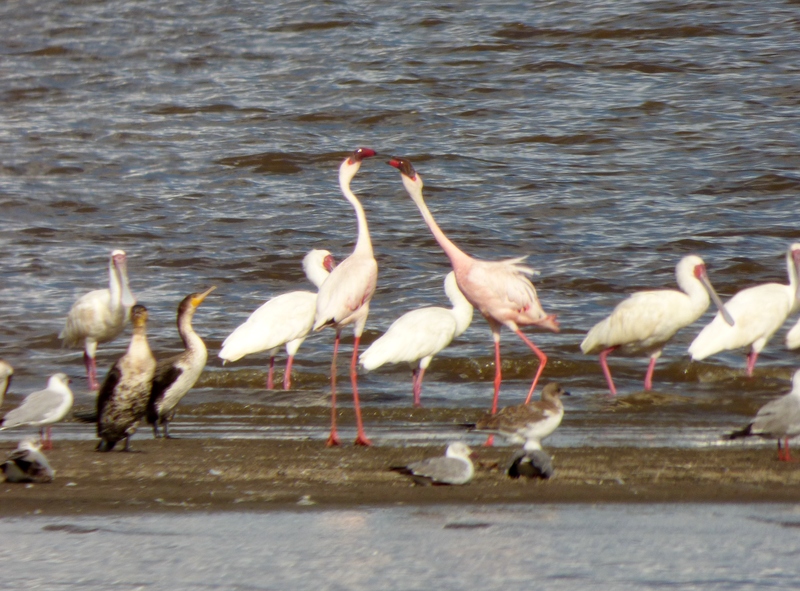 Flamingos and seabirds at the water’s edge. As usual, I was traipsing around on the periphery of the group, doing my own thing exploring every piece of driftwood and inching closer to the seabirds for photo ops. While everyone else was diligently listening to the guide give his nature talk, I stepped onto an unstable area of the beach and immediately found myself up to my calf in wet sand. I was afraid to go closer to the water to wash it off. 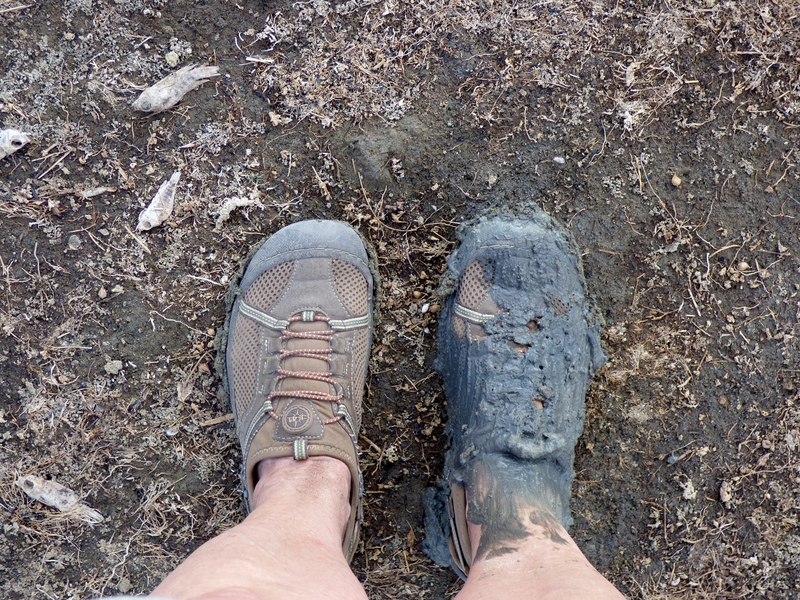 While it was more of an embarrassment and not a real threat to my safety, I scurried back to the group sheepishly who couldn’t help but notice my mucky shoe and leg. I was often getting into some kind of “trouble” and a few members began to tease me about my near immersion. I was recalling that experience the other day and it triggered my thoughts about how easy it is to look out over the landscape of our lives, oblivious to the perils that lie just beneath the placid surface. We live so much of our lives in blissful denial until loss or sickness or tragedy strikes us, yanks us beneath the surface and we find ourselves fighting our way back up for light and air. In times like this, I am reminded to simply be calm and present. The scripture says “Be still and know that I am God.” Psalm 46:10. I find a lot of power in those words. I know God but it is the “being still” that I have problems with. Worry is like quicksand and our frenetic actions only serve to take us under deeper.I try to be conscious of my circle of influence, which is really very small. My ability to differentiate between what is within the realms of my control and what is not helps me feel more at peace. How about you? What helps you when you feel life is dragging you under?